Technical Car Experts Answers everything you need: How to replace rear wheel bearings on 1997 subaru impreza ? 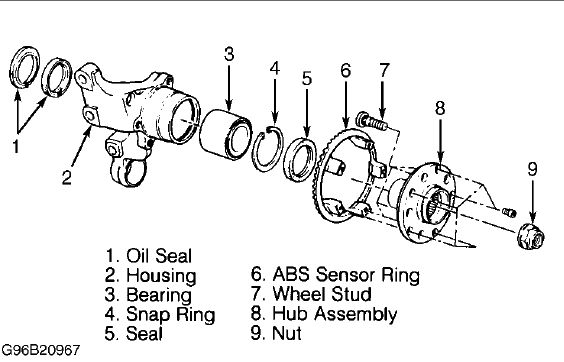 How to replace rear wheel bearings on 1997 subaru impreza ? In order to remove the bearing, you will need a bearing press and press stand. You will also need to press the new one in. DO NOT use a hammer an chisel to remove the old bearing-you will damage the axle housing and cause the new bearing to lock up. DO NOT hammer in new bearing- you will damage it. Once you get the axle housing off, you can take it into a repair shop or machine shop and have them press the old one out and press in the new one. Or, if you have a Napa or Carquest close by, they should have a press to do it for you.